Dense kelp forests can be found in the shallow hard-bottom sublittoral (5-30 m) in Hornsund as well as in other Spitsbergen fiords. 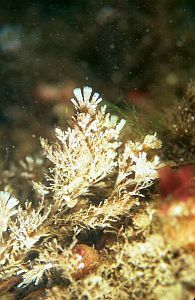 These macroalgae communities consist mostly of big (up to 2-3 m high) kelps: Laminaria digitata, Laminaria saccharina, Alaria esculenta, together with smaller algae as Phycodrys rubens, Desmarestia sp. 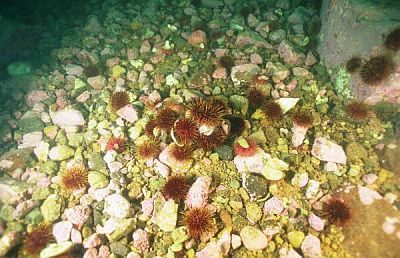 Their distribution is limited by light conditions, and by occurrence and abundance of herbivorous sea-urchins Strongylocentrotus droebachensis (Fig. 1). 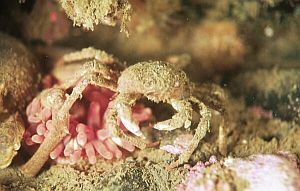 They are important component of ecosystem as primary producers but also provide a habitat for a number of invertebrates. They provide a substrate for sedentary colonial animals as bryozoans or a shelter for mobile invertebrates as crustaceans or molluscs (Fig. 2). Fig. 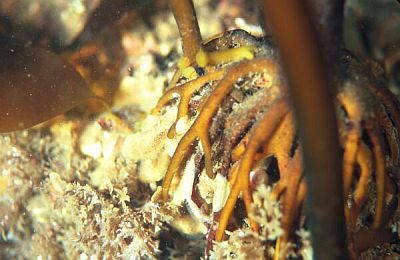 2.Invertebrates of kelp-associated communities. Fot Piotr Kuklinski. The specific communities consisting of bryozoans, polychaetes and molluscs are associated with kelp holdfasts (Fig. 3). 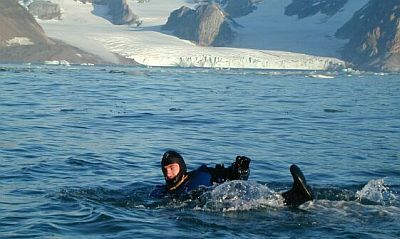 The Arctic tidal glaciers, often situated in the innermost parts of the fjords, strongly impact fiordic ecosystems. Seasonal or continuous inflows of fresh glacial melt-water, loaded with mineral material, influence the structure and circulation of water masses and turbidity, primary productivity, sedimentation processes and sediment characteristics. 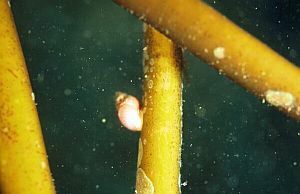 In the kelp forests community the high load of mineral suspensions affects both the algae and the animals. The high concentration of suspensions in water increase turbidity Â influence the light conditions. The mineral particles bury the organisms, cause an increase in the energetic expense connected with their elimination, dilutes nutritious particles in a mass of mineral particles, or even clogs filtering mechanisms which in turn hinders respiration and nutrition. That is especially disturbing for filtering- suspension feeding animals. The ice-bergs calving from the active glaciers scour the bottom especially the shallow sublittoral in the areas close to glacier fronts. In our project we aim to study the distribution of algae-associated fauna in relation to the glacier-induced mineral material sedimentation. We will try to learn how the high load of mineral suspension affects the growth of macroalgae, the distribution of algae-associated species, the patterns of biodiversity and functional groups composition, the processes of succession of macrobenthic community on selected species of kelps. 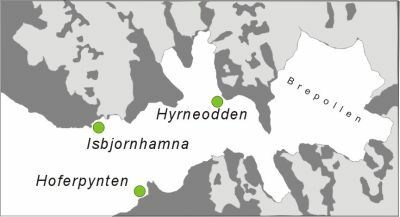 At each site samples were collected at two depths - 5 and 10 m. At least five algae of most common species (L. digitata, L. saccahrina, A. esculenta, Phycodrys rubens, Desmarestia sp.) and associated fauna were samples at each site/depth. Each algae and associated fauna was carefully collected and carried in a separate bag (of 1 mm mesh size). For succession study several samples of L. saccharina and A. esculenta were taken additionally. 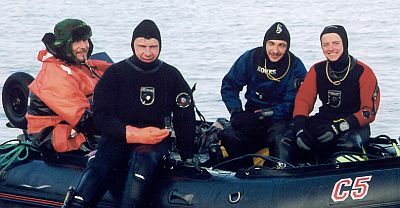 The environmental measurements/sampling at each site/depth included STD profiles, optical measurements, sampling of water samples for inorganic and organic suspended matter concentrations as well as POC/PON concentrations in suspended matter, current meter measurements, sediment traps deployed on the bottom for 24 hours. In laboratory the age of each algae was noted and the algae was divided into cauloid, phylloid and rhizoid. The length, weight and volume of each part of each algae was measured. The fauna was fixed in 4 % formaline and will be identified in our lab in Sopot. We will analyse the relation of faunal associations composition and diversity to depth, site/level of inorganic sedimentation as well as species, age and size of algae. We would like to thank the crew and especially the leader of XXVI Polish Expedition - Dr Krzysztof Migala for all help, warm welcome, home-like atmosphere experienced at Polish Station in Hornsund. Our work in Polish Station was possible thanks to Dr Piotr Glowacki and prof Jan Marcin Weslawski, which is gratefully acknowleged. We are very grateful to Mr Alfred Pietrzykowski and Mr Jan Mandat who helped us with the field work, and Mr Radomir Jaskula (University of Lodz) who spent several hours in our laboratory voluntarily helping with lab work. We would like to thank Dr Marek Zajaczkowski for his help in expedition organisation and environmental factors measurements.